DREAMING MY LIFE AWAY « THE BRYCE IS RIGHT! I love a good dream. I don’t remember ever suffering from nightmares, but I have had some great dreams over the years. I’m not sure why we do it other than it might be the way we kick start the brain into action in the morning. Other than being a pleasant escape from our earthly bounds, I have always looked upon dreams as being rather symbolic. I’m sure psychologists would have a field day analyzing mine. My most common dream is revisiting the homes and places I lived during my youth. Interestingly, there have been few changes made to the houses and I instinctively know where everything is. Sometimes I meet with old friends and relatives who have passed away a long time ago, as well as those still alive. My favorite of this genre is going back to my old high school for a football game where the current coach asks me to suit up to go play my old position on the line. I’m pleasantly surprised by the request, but eagerly ready myself as I relish the opportunity to play again. I know the kids are younger, faster and stronger than I am now, but I surprisingly hold my own in the game. Since I was young, I’ve experienced Déjà vu dreams. I learned if I awoke and could remember the dream, it would never come true, but if I woke up and couldn’t remember it, the dream would indeed come true. I would see the Déjà vu played out well after I’ve had the dream, sometimes weeks later, sometimes months or even years later. Most of my dreams in this capacity are not significant, I just realize I’ve already experienced the moment. Interestingly, I seem to have had more Déjà vu dreams in my youth, but as I grow older they become fewer and far between. Maybe I’m just running out of ideas. In my 20’s I experienced a recurring dream of frustration whereby I am running around the old cinder track at my high school’s athletic field whereby I am running into a powerful force of wind pushing against me. To compensate, I ask my body to run as hard as it can, calling on every muscle to work harder, going to the point of seeing my blood vessels pumping from my body. Yet, with every stride I take, my progress is resisted. Then, all of a sudden, I hear the footsteps of another runner coming from behind me. I turn my head only to see a much smaller man rush by me unimpeded by the wind and sprinting away. I then stop and watch him in disbelief. So vivd was this dream that I would often wake up in a sweat. I experienced this for several years but it seemed to disappear around the time I turned 40. I guess this is why I abhor running any long distance, even to this day. Perhaps the most exhilarating dreams I’ve had are those where I fly. I love my flying dreams and I am actually quite good at taking to the air. In most cases, I just extend my arms, hands and body to form a sort of kite. The wind then gently pushes me up into the air and I find that if I move my hands and body ever so slightly I can move in just about any direction I want. As I live in Florida, I love to fly away from my house and up and over to the beaches and out to a nearby island where I meet my family. Once airborne, I want to stay aloft for hours at a time but inevitably return home. I’m told, dreams of flight are indicative of accomplishment. Regardless of the reason, it is a hoot. Now in my 50’s I have developed a new recurring dream and I am not certain what it means or why I have it. Nonetheless, I dream I am an exhausted Doughboy in World War I returning to my trench in France. 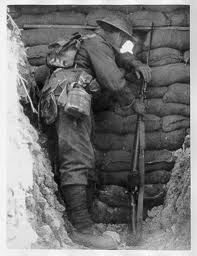 Although there are small rooms dug into the ground which serve as bunk houses for soldiers, I have elected to dig my own hole and line it with two parallel sheets of corrugated steel which I believe will protect me from the Germans. I’ve placed a hinge on one of the steel panels, thereby allowing me to drop one of the panels down and enclose myself in a small room safe from the elements and the enemy. I am wearing a full American uniform, complete with the old flat helmets of the period, along with leggings and boots. This seems a bit strange to me as my grandfather had served in the English Army during the war. Concerned for my safety, I pull out my bayonet and stick it in the ground so I can easily grab it in case of emergency. On it, I hang my gas mask so I can get to it quickly in case of attack. I sleep with my Springfield rifle loaded and near me for protection. I feel dirty and my feet are tired, but as I’m exhausted I am just grateful to be able to fall asleep, which I do. Again, I don’t know how or why this dream developed, as I see it all in meticulous detail, but it has been a regular part of my nightly repertoire for the last few years. Maybe it’s from a former life. I don’t try to analyze my dreams as I just enjoy them as they come along. I have met a lot of people who tell me they do not dream at all. Frankly, they don’t know what they’re missing. One last thing; I dream in color. This entry was posted on September 29, 2011 at 8:23 am	and is filed under Life. Tagged: DREAMING MY LIFE AWAY, Florida, MBA, palm harbor, The Bryce is Right, tim bryce. You can follow any responses to this entry through the RSS 2.0 feed. You can leave a response, or trackback from your own site.